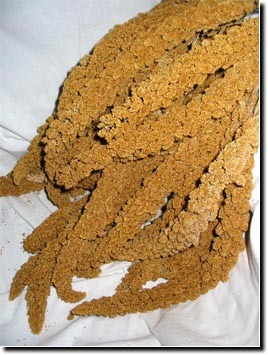 California Premium Spray Millet – superior quality millet bird seed. "...Your spray millet sprouting idea is fabulous! 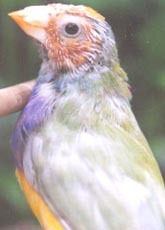 I had one of my favorite bald gouldians for longer than I would like and within 2 weeks of giving her the sprouted spray millet with the epowder and fvite sprinkled on it she started getting pin feathers!" "I have ordered millet from other companies and I have even bought millet from a man that grows it here in VA. I could never smell the millet. Your millet smells very fresh and sweet. It's the first millet I have ever been able to smell. I LOVE IT!!!! I honestly didn't know millet smelled like that. My babies (my birds) are absolutely going to LOVE this!!!! And just to let you know, my smeller isn't gone because I'm old. I'm “Only” 48, so the smeller still works. LOL!!! Thank You!!! " Just a few short weeks ago the millet field was at its most beautiful, the seed heads were hanging down from the willowy, six-foot high stocks waving in the warm afternoon breeze. The slender plants had their roots buried deep in the fertile soil just north of the Sacramento River Delta. The unique combination of warm, cloudless days and night cooled by the delta breeze gave them just the right environment to produce the highest quality millet. California Premium Spray Millet® provides a healthy, nutritious, pleasantly sweet-smelling product to support your bird’s good health. California Golden Spray Millet® is grown on fertile, mineral-rich soil, which produces a nourishing bird food. California spray millet is handpicked and sun-dried to ensure our customers birds receive a Premium Spray Millet® to feast on. It is carefully pack and stored in a controlled environment which enables Golden Farm Products® to keep the spray millet harvest fresh. 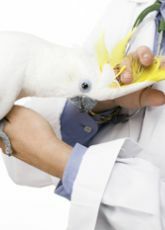 Birds are very sensitive to what they eat. 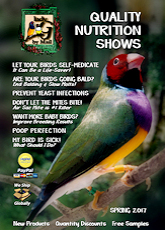 California Spray Millet is a superior spray millet that your birds love and thrive on. We welcome and appreciate your comments. We believe in total customer satisfaction. If you choose to send a check for the product purchase, please call 800.579.7974 or email Support@ladygouldianfinch.com for a shipping quote.